Its name sounds a bit like an amusement park ride, but Flume Gorge in Lincoln, New Hampshire, is not an attraction any engineer dreamed up. Powerful natural forces — molten earth, ice, flowing water and frost — have shaped this fascinating chasm: a highlight of New Hampshire's Franconia Notch State Park. It's a must-see while you're in the White Mountains region. Here's our complete guide to the natural wonder, including its history and tips for planning your visit. The story of this impressive, narrow gorge begins some 200 million years ago during the Jurassic period, when a cooling trend caused molten rock to solidify into the granite New Hampshire — the Granite State — is famous for. Basalt, a darker igneous rock, flowed up through cracks in the granite and solidified to form dikes. As the main dike eroded, Flume Gorge was created. Fast-forward to the last Ice Age, when mile-thick glaciers blanketed New Hampshire. As the ice eventually melted, it left behind boulder-sized debris and a rush of water. Flume Brook still tumbles in waterfalls through the chasm today. Water and frost continue to carve and fracture the ancient rocks of the flume's 70- to 90-foot-tall walls. Imagine stumbling upon this geologic wonder one day while you were out fishing. That's what happened in 1808 to 93-year-old "Aunt" Jess Guernsey. Even her own family was dubious when she described what she'd found. But soon, she convinced others to have a look. And even without the benefit of social media, word traveled fast about this spectacular sight. The first tourists came by stagecoach to see Flume Gorge, and people haven't stopped visiting since. 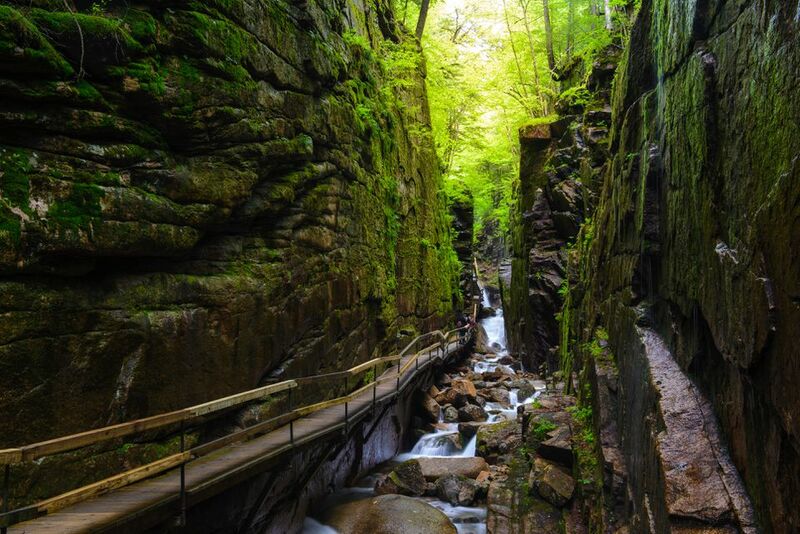 Your admission fee at Flume Gorge allows you to embark on a self-guided tour of this photogenic chasm. If you choose to complete the entire loop, it's a 2-mile walk mostly along wooden boardwalks and stairs that take you right up close to moss and lichen-speckled rock formations and waterfalls. This map offers an overview of the hike, Before you set out, spend time watching an introductory video and viewing exhibits in the Visitor's Center. The Flume Covered Bridge: A bright red "kissing bridge" built in 1886 over the Pemigewasset River. It's one of the oldest surviving covered bridges in New Hampshire. Table Rock: A massive outcropping of pinkish Conway granite smoothed by Flume Brook. The Old Man of the Mountain, a gone but not forgotten feature of Franconia Notch State Park, was also made of Conway granite. Avalanche Falls: Since 1883, this thunderous, 45-foot waterfall has given the gorge its soundtrack. You'll have an up-close view from the top of the Flume and feel the falls' cooling mist. Bear Cave: This dark, boulder-roofed cavern begs to be explored. Liberty Gorge: I you choose to continue the hiking loop, follow the Ridge Path downhill and watch for signs pointing you toward this gorge and its cascading mountain stream. Sentinel Pine Covered Bridge: Pause as you walk across this second covered bridge to admire the view of the Pemigewasset River.This is a particularly beautiful spot in the fall. Wolf Den: Good luck crawling and wriggling your way through the rocks if you opt to follow this narrow, one-way path. Glacial Boulders: Some of these "erratics" dumped here by Ice Age glaciers weigh more than 300 tons. Flume Gorge is located within Franconia Notch State Park at 852 Daniel Webster Highway in Lincoln, New Hampshire. It's about an hour north of Concord, just off I-93 at Exit 34A. Flume Gorge is open to the public from mid-May through mid-October. In the winter, it becomes a destination for ice climbers. You'll appreciate the shade of the gorge's steep walls and the mist of its waterfalls most on a hot summer day. It's tough to beat the peak of fall, though, if you're aiming to shoot photos. That typically occurs during the first half of October. You'll find a full range of accommodations within a short drive of Flume Gorge: everything from the clean and cheap Notch Hostel to the extraordinary and historic Omni Mount Washington Resort. The nearest place to stay is Parker's Motel, less than a half-mile away. The Mount Washington Valley Chamber of Commerce offers an online places to stay guide, which is searchable by key features such as "pet-friendly" or "indoor pool." You can also call them toll-free at 800-367-3364 for lodging suggestions and assistance. Ride the Cannon Mountain Aerial Tramway: The aerial views are stunning, and this sky ride is right in Franconia Notch State Park. You're already there, so don't miss it. Drive the Kancamagus Highway: New England's most superb scenic road. See the Bear Show: And enjoy all of the diverse enticements at Clark's Trading Post. Cool Off at Whale's Tale Waterpark: A family favorite for more than a quarter-century of summers. Photograph More Waterfalls: The Mt. Washington Valley is the ideal place for a waterfall safari. Indulge Your Sweet Tooth: At Chutters, home of the world's longest candy counter.